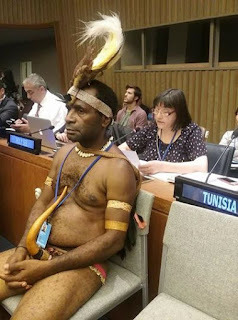 This is a delegate representing Western New Guinea, also known as Papua. conference at the United Nations Headquarters in New York. opinions was pictured sitting with other delegates in his traditional attire. 0 Response to "See What A Delegate From Papua New Guinea Wore To An Event At UN Headquarters In New York (Photos)"